Pizza Night on the Akorn. 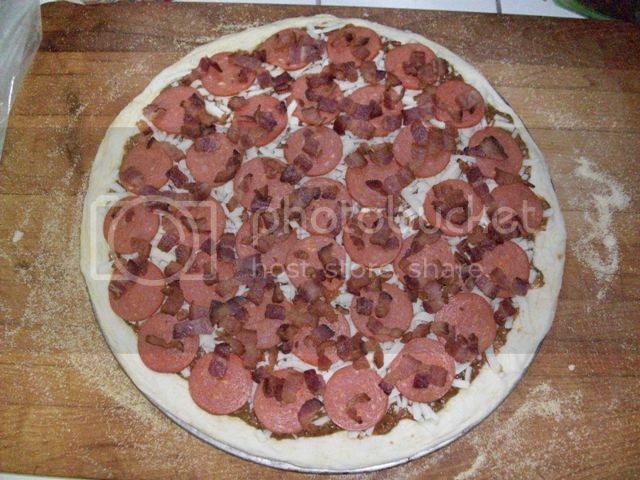 Posted: Thu Jul 12 12 5:40 am Post subject: Pizza Night on the Akorn. I decided to make some pizza tonight and show how the Akorn works for this offering. Loaded the cooker up with Royal Oak lump and some apple wood chunks. I like to use a double defuser for pizza as I find just one pizza stone is a wee bit hot on the bottom of the pie. 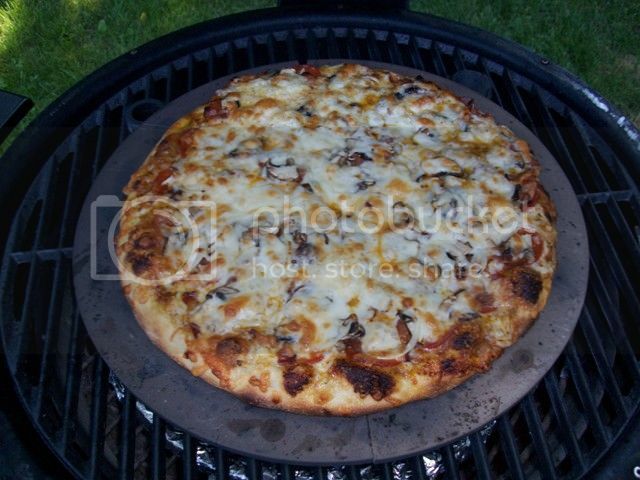 I have one pizza stone on the lower grate and one on the main grate.. Works real good.. Less heat to the bottom of the pie so the cheese can melt and brown a bit. I got some dough from an Italian resto here in town.. Real good stuff and I am hard pressed to make better. 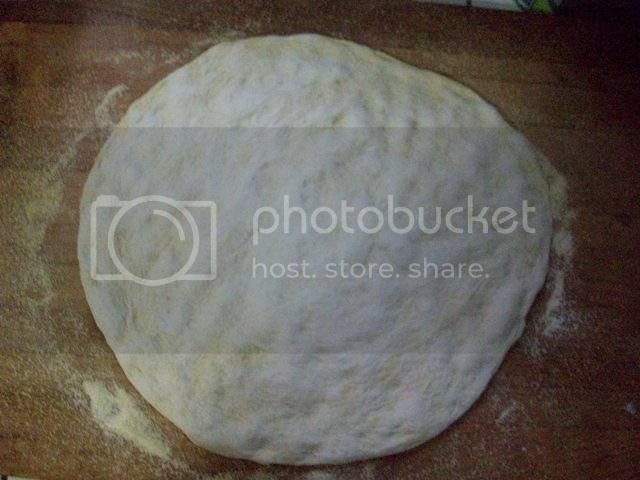 I work the dough out with my fingers by pressing them into the dough till I get almost the size of pizza I want. I then give it a wee stretch over my hands.. No rolling pin as I want a few bubbles in the crust. 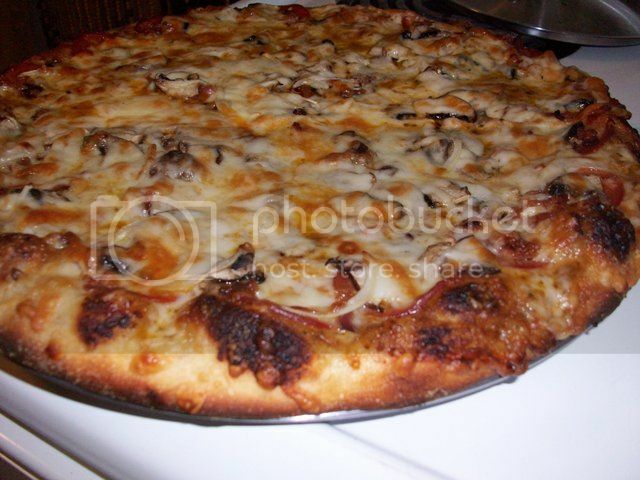 For the first pie my wife wanted a "Canadian" pizza with Pepperoni,bacon and mushroom. More to come as things unfold.. Hope I dont burn this beauty or I am sleepin on the couch.. Looking good so far!! Can't wait for the finished pics. Looks like a good start. Hope to see some finish pics. So here's the rest of the pix. I think this was my best effort yet with making pizza on the Akorn. Real crispy crust and nice bubbles inside. Canadian just about ready to come off. I think this is about 5 minutes in. 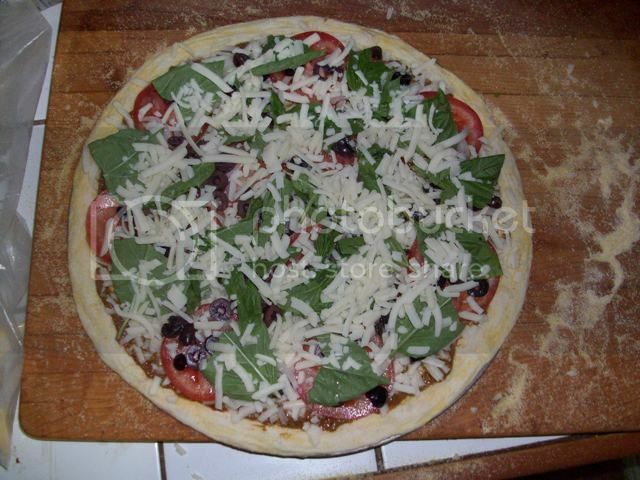 The second pie had tomatoes, basil, black olives and some sweet onion..
Smokin hot. 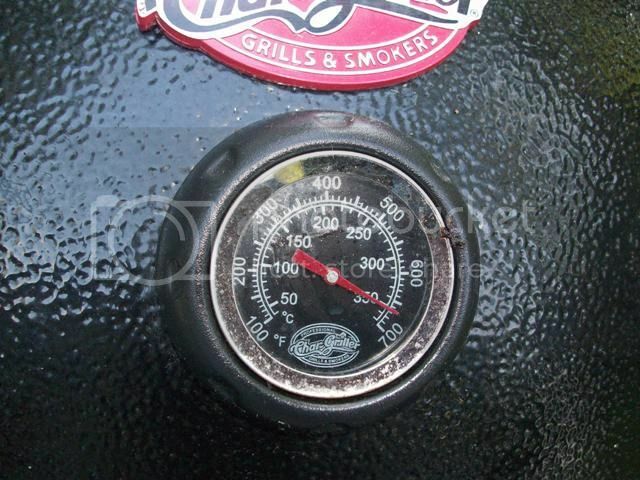 I think it was a lot hotter than the guage said, nearly took my eye brows off when I opened the lid..
Ready to come off in just over 4 minutes, if that..
David, that right there is making my hamburger patty and brat look small. Can you send me a slice or two or three. Nicely done my man. I'll give that a solid HELL YA!! STOP ALREADY!!! You are making me think I need to go buy an Acorn!!! Damnit!!! Seriously tho...that looks really good. Sure Bro, the VERY DAY I go back on my 100% protein diet, you gotta post this....Man, your making those carbs look great!! I wish you offered delivery. Nice looking pizzas, Roxy. I can almost smell them from here. Manana. Just a little something you can now make in your backyard. KAM. Thanks my man. It sure was good. HFG. Pizza is one of my favorite foods. Great to be able to make decent pie at home. Rollin. Pull the trigger, you wont be dissapointed. Mr T. Good luck with the diet.. Something to look forward to when you can carb it up again. GF. No delivery.. Dine in only. zski. Some wood smoke sure did the trick. I am loving the Akorn. The high heat sure does make "a nicea pizza pie.."
Very nice Roxy. I always enjoy your posts. I have an Akorn as well. I have not made a pizza, but it sure cooks one heck of a steak. Thanks for sharing. Building up courage to try it.. 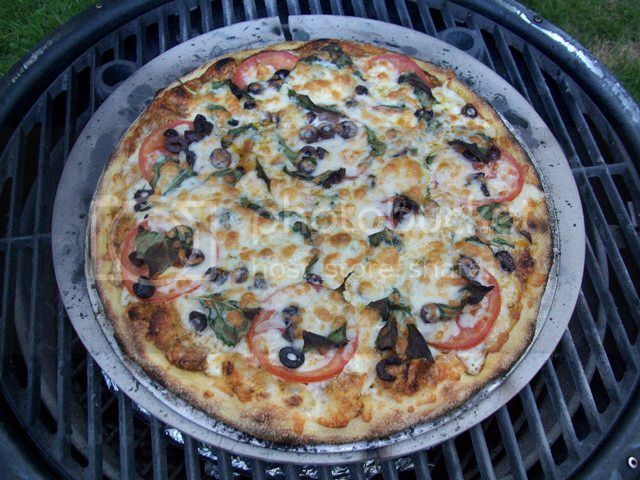 Them look absolutely fantastic..
Posted: Thu Jul 12 12 9:37 pm Post subject: Re: Pizza Night on the Akorn. 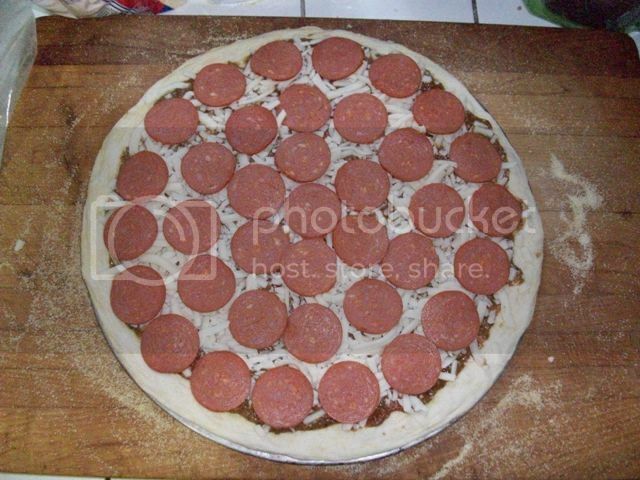 Gorgeous pizzas, my only "complaint" is that the pepperoni belongs on top of the cheese. Durn it! I was going to ask you for the recipe. I make my own (on the gasser grill and in the oven), but it works best for super thin (cracker) crust. My family (wife in particular) would like a thicker crust from time to time so I've been on the look out for a good version to try. ICD - Do it. The only things you really need are a good stone and a hot oven, the rest is up to personal interpretation. Posted: Thu Jul 12 12 9:43 pm Post subject: Re: Pizza Night on the Akorn. 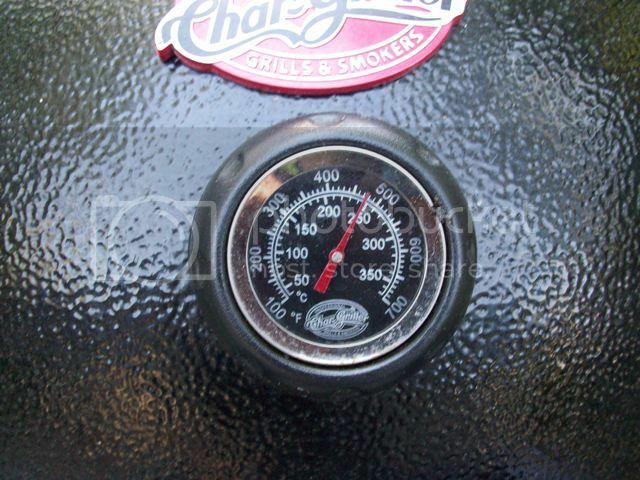 If I had a Kroger near by I would check there by all they have and make enough back to pay for my own..
Only my wife would kill me for buying a 7th cooker. That is one awesome looking pie Roxy! 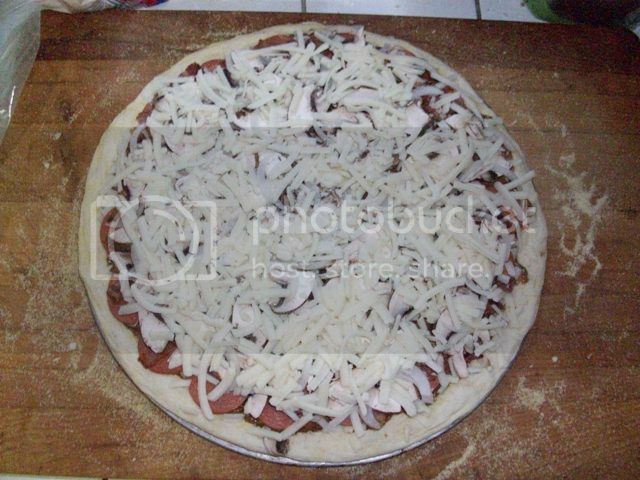 Posted: Thu Jul 12 12 11:34 pm Post subject: Re: Pizza Night on the Akorn.